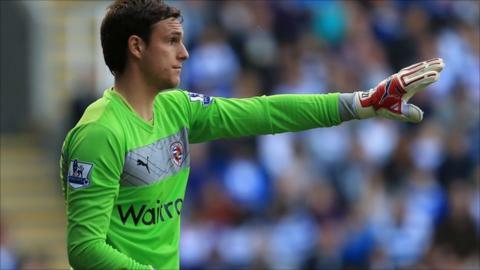 Reading goalkeeper Alex McCarthy has admitted he has to remind himself how lucky he is ahead of Saturday's trip to face Liverpool at Anfield. McCarthy, 22, is now Reading's first-choice, having displaced Australian Adam Federici in goal. "Liverpool is a massive club and you have to pinch yourselves sometimes," McCarthy told BBC Berkshire. "It makes me realise how far I have come. To play there in front of a full stadium is going to be unbelievable." We have some great goalkeepers here, but now I've got my chance I want to keep it. He continued: "It's a massive game. These are the ones that you look forward to in your career so I really can't wait." McCarthy spent much of his early career out on loan and now he has won a place in the Royals team he is determined to hold onto it. "Going out on loan to those nine different clubs has got me to where I am now. Still being young, I'm only 22 now, I needed that experience to boost my career so I'm thankful to those clubs," he said. "You don't want an easy role in the team where you know you're playing every week - you want competition. We push each other on and makes you a better player. "Last season Feds had an unbelievable season and I had to bide my time on the bench, which is not what I wanted to do.